1897. -- The new Water Works at Pond Park constructed at a cost of about £35,000. A small reservoir on the same site, called "Boomer's Reservoir," was made in 1886 as an auxiliary to "Duncan's Reservoir," which was constructed in 1861. The small reservoir in the Wallace Park is of ancient date, and was there considerably over a century ago. The place where it stands was known as "Bason Hill," and the pipes from it supplying some houses in the town were made of wood. 1898. -- The Roman Catholic Church, Chapel Hill, was originally built about the year 1794, and was superseded, on the same site, in 1898 by the present edifice. Previous to 1794 worship was conducted in a building which stood on the south side of Bow Street, immediately opposite the end of Antrim Street. St. Joseph's Hall built in 1889. 1898. -- The County Councils Act came into force. On January 16, 1899 a new election of Commissioners took place under the name of Urban Councillors. 1900. -- Wallace Avenue opened, connecting Railway Street with the Belfast Road, and passing through the private grounds of Sir Richard Wallace's Castle, built in 1880. Clonevin Avenue, connecting the Antrim Road with the Magherleave Road. Graham Gardens, or Wardsborough Road, connecting Railway Street with Bow Street and Bachelors' Walk, opened in same year. 1900. -- Sloan Street Presbyterian Church opened for public worship. The cost of site and building amounted to almost £3,000. 1900. -- George St.George, M.D., chairman, Lisburn Urban District Council; 1901-1902-1903, Geo. B. Wilkins; 1904, James A. Hanna; 1903-1906-1907, George B. Wilkins; 1908, James Pelan; 1909-1910, Harold Barbour; 1911, John G. Ferguson; 1912-1913-1914, W. J. M'Murray; 1915, Robert Griffith; 1916, Thomas Sinclair; 1917, James M'Nally; 1918-1919, William Davis. 1903. -- Hill Hall Presbyterian Church opened for worship. About 1740 a thatched church was erected on the same site, rebuilt in 1826, enlarged in 1868. 1905. -- Lisburn Golf Club formed. 1906. 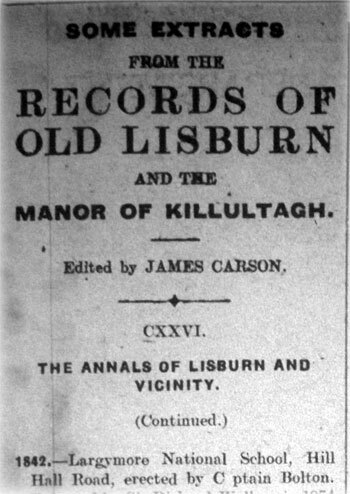 -- A comprehensive and exhaustive history of Lisburn and its institutions compiled by Mr. W. J. Greene in connection with the Largymore School Bazaar. 1906. -- New sewage works and filter beds at New Holland completed at a cost of some £65,000. 1911. -- The Coronation Flagstaff erected in the Wallace Park. 1911. -- Lisburn Gas Company taken over, by the Urban District Council. Cost of purchase, including law costs, &c., about £40,000. 1912. -- Sir John E. A. Murray Scott, one time secretary to Sir Richard Wallace, inherited a vast fortune from Lady Wallace. He died in 1912, aged 65 years. It was largely due to his advice and influence that Lady Wallace bequeathed the "Hertford Collection" to the nation. Lady Wallace died in 1897. 1913. -- The Ulster Volunteer Force drilling and preparing to resist, if necessary by force, the imposition of Home Rule on Ulster. Friday night, April 24, 1914, the "Mountjoy" made Larne Harbour, and discharged her cargo of rifles and ammunition. Hundreds of motor cars and motor lorries were in readiness, and these distributed the munitions all over Ulster before breakfast time the next morning. 1913. -- Robert Redman Belshaw died in 1913 at an advanced age. His forbears lived for generations in the Parish of Magheragall. He was a noted book collector, and under his will a valuable collection of books and pamphlets relating to Ireland passed into possession of the Linenhall Library, Belfast. 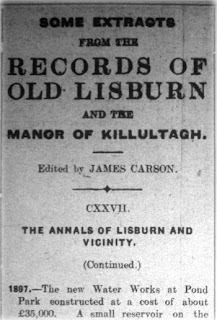 His contributions to the "Lisburn Standard" on local subjects extended over a long series of years, and were interesting and valuable. 1913. -- The Sackville case came before the Courts in London, whereby Lady Sackville, under the will of Sir John Murray Scott, benefited to the extent of some £500,000. This vast sum of money came to Sir John practically, it may be said, from the Hertford estate in Ireland. 1914. -- Technical School, Castle Street, opened. The Lisburn Urban Council procured for this purpose the Castle built by Sir Richard Wallace in 1880. It cost Sir Richard, to build, some £20,000, and was acquired by the Council for £2,000 free of all encumbrances. 1916. -- A considerable portion of the Wallace Park was let to plot holders and cultivated for the production of food. 1916. -- The Ulster Division, on July 1st,. made the ever memorable and glorious charge at Thiepval, when Captain C. C. Craig, M.P., and Major Jenkins were taken prisoners of war and Captain Cecil Ewart killed. The 11th Royal Irish Rifles, composed largely of Lisburn men, bore itself gallantly, and suffered severely on that day. 1918. -- On November 11th the Great European War may be said to have ended. On that day, at eleven o'clock, the armistice was signed, and Great Britain and her Allies emerged triumphant from the titanic struggle, which had extended over period of four years and three months. 1918. -- Canon Carmody appointed Rector of the Cathedral. 1919. -- The Belfast Bank, Ltd., opened a branch in Bow Street. Mr. J. A. Cooke, manager. Next Week:-- "Market Square Presbyterian Church." 1842. -- Largymore National School, Hill Hall Road, erected by Captain Bolton. Enlarged by Sir Richard Wallace in 1874 and 1881. In 1901 placed under charge, of the Cathedral. The old buildings were taken down in 1906, and new premises erected at a cost of some £2,000. 1842. -- The Diocese of Dromore united with Down and Connor. 1842. -- The third Marquis of Hertford died in 1842. He was the original of the Marquis of Steyne in "Vanity Fair," and Lord Monmouth in "Coningsby." The fourth Marquis died in 1870. He was known from 1822 till 1842 as Earl of Yarmouth. With the exception of a short visit in 1845, by Richard, fourth Marquis, neither he nor his father ever visited the Irish estate between 1822 and 1870. 1849. -- Lambeg Church built on the site of an ancient monastery. 1850. -- Samuel Kennedy Cowan born at Lisburn 1850, died 1918. A prolific writer of verse. 1850. -- James Watson, of Brookhill, "The Young Commodore," died in 1850, aged 88 years. 1853. -- The Friends' Meeting House, Railway Street, rebuilt. Prior to that date a meeting house stood on practically the same site, and it is on record that it was there previous to 1707. 1854. -- Lisburn Cricket Club entered into possession of their present ground. In 1884 the four granite boundary stones were placed in position defining its present limits. 1857. -- Brigadier-General John Nicholson was born in the year 1822. His early years were spent in Lisburn, and he always considered it as his home. He obtained a commission in the Bengal Infantry in 1839, and immediately proceeded to India. He was a great and glorious soldier, "the heroic Nicholson," as the men of his own generation loved to call him. He fell leading the assault at Delhi, September 23, 1857, and was buried close to the Kashmir gate. There is a tablet to his memory in the Cathedral, Lisburn. 1859. -- The year of "The Great Revival." Some write of it as "The Year of Grace," others as "The Year of Delusion." It was a year of extraordinary religious excitement, in which Lisburn participated to a remarkable degree. 1861. -- Prior to 1861 Pumps were relied on to meet the water requirements of the inhabitants. 1861. -- Population 7,484, houses 1,220. Population 1911, 12,388, houses 2,630. Lisburn urban district comprises 1,136 acres. 1863. -- Lisburn weavers to the number of 253, including men, women, and children, sailed on board the "Old Hickory" from the port of Belfast for America. 1863. -- Parliamentary contested election between John D. Barbour and Edward Wingfield Verner. Mr. Barbour was returned by a majority of six votes, but was unseated on petition soon after. Mr. Verner was then elected member and represented Lisburn until Sir Richard Wallace entered into possession of the Hertford estate. Sir Richard Wallace was returned unopposed in 1874, and represented the Borough till 1886, when it was absorbed in the South Division of County Antrim. W. G. E. Macartney was elected for South Antrim in 1886, Charles Curtis Craig in 1903. He has represented the constituency since. 1864. -- Railway Street Presbyterian Church opened for worship. Later it was enlarged and a number of necessary alterations made. Through the generosity of Mr. James Crossin, J.P., a valuable organ was installed in 1914. The Lecture Hall was erected in 1889. The Brownlee Memorial Schools, Wallace Avenue opened in 1913. The E.M.B. Memorial Hall, Hilden, erected in 1911. 1865. -- The Ulster Bank opened in Lisburn. First manager, John E. Morton, succeeded by George G. Tew, 1876; J. H. Vint, 1887; David Strain, 1889; James Carson, 1894; Thomas Malcomson, 1900. The new Bank House in Bow Street built 1913. 1867. -- The Island Spinning Company established, the premises having been purchased from J J. Richardson. The original spinning mill was erected in 1840. In 1871 an extensive weaving factory was added, and in 1882, the production of linen thread was introduced. The Island in the River Lagan on which the factory stands, was originally known as Vitriol Island. 1870. -- North Circular Road constructed by the Railway Company. 1871. -- The Orange Hall, Railway Street, opened. 1872. -- Action for libel. Walter T. Stannus v. "Northern Whig." The damages were laid by Mr. Stannus at £10,000, and resulted in a verdict for £100. The libel consisted in strictures made by the "Northern Whig", on Mr. Stannus's Management of the Hertford estate. 1872. -- Sir Richard Wallace, Bart., entered into possession of the Hertford Estates in Ireland. Sir George Hamilton Seymour contested with Sir Richard Wallace the will of the fourth Marquis of Hertford, who died in 1870. There were three trials. Pending appeal to the House of Lords a compromise was come to whereby Seymour accepted four hundred thousand pounds and allowed the Irish Estates to remain with Sir Richard Wallace. Sir Richard died in 1890, aged 72 years. 1874. -- The gross valuation of the town in 1874 was £15,339; 1884 £19,392; 1894 £25,459; 1905 £30,753; 1911 £32,526. 1917-1918 Town Rates including Poor Rate 9/3 in £. 1874. -- The Towns Improvement Act adopted in Lisburn. 1875. -- The Methodist Church, Belfast Rd., opened for worship. Previous to that date worship was observed in a building in Market Street. The original church there was built about the year 1774. The Rev. John Wesley officiated frequently in the Market Street building, and addressed immense multitudes in the Linen Hall (which stood on the site) of the Butter and Egg Market. Seymour Street National School was opened in 1886. In 1908 it was superseded by the William Foote Memorial Schools on the same site. 1876. -- Rev. Hartley Hodson, Rector of the Cathedral, 1876-1884. 1876. 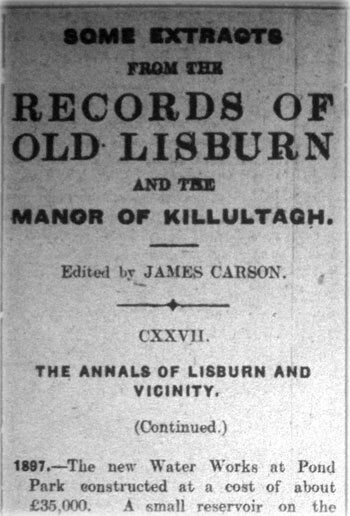 -- The "Lisburn Standard" was first published in 1876 by Wm. Johnston and later carried on by J. E. Reiley, in a house in Castle Street. Victor McMurray took it over in 1913 and removed the plant to Market Square. 1877. -- Bywash covered in. Prior to this date it was an open stream into which the sewerage of the town flowed. It started at Stewarts Mill, crossed Antrim Street, passed along McKeown St., which is now erected on top of new culvert, through the Bank Garden, crossed Bow Street near the Ulster Bank, then into Smithfield, and thence via the Gas Works into the canal. The stream from the Park, which crosses the railway and Bachelors' Walk, joins the Byewash near the Bank Garden. 1877. -- Level crossing over the railway lines at end of Railway Street discontinued, and the Boyne Bridge built. 1877. -- Sidepaths flagged at a cost of some £3,300. 1878. -- New Cemetery, Dublin Road, opened. Additional land acquired in 1900. The first person interred was Mr. William John Knox, Railway Street, September, 1878, who died when on a visit to Paris at the invitation of Sir Richard Wallace. 1880. -- The Union Bridge over the Lagan, connecting the Counties of Antrim and Down, opened. It replaced an old narrow structure on the same site. 1880. -- The Intermediate School, Antrim Road, founded by Sir Richard Wallace. 1883. -- William Barbour & Sons, Limited thread manufacturers, incorporated as a limited company. In 1784 John Ban hour, a native of Paisley, erected a small mill at the Plantation. In 1823 he was succeeded by his two sons, John and William. William removed to Hilden and, twelve years later, purchased the original business at the Plantation, and removed the plant to the works at Hilden. William died in 1875, and the management of the now extensive works passed to his sons. In 1898 the firm joined with other Irish, Scotch, and English thread manufacturing firms, forming the Linen Thread Co., Limited. 1883. -- The Courthouse, Railway Street, built by Sir Richard Wallace at a cost of £4,000. 1884. -- "Lays from Lisnagarvey" published by Thomas Campbell, Low Road, Lisburn. 1884. -- Sir Richard Wallace presented to the town the "Wallace Park," containing 28 acres. Along the side of the railway, in the Park, is the "Dean's Walk," so called from having been planted by Dean Stannus, one time agent to the Marquis of Hertford and Rector of the Cathedral. Sir Richard constructed the main road through the Park, the bandstand, the park rangers' lodges, and the entrance gates and approaches. The pond in the Park was not in the original grant, but was acquired latter from Lady Wallace when the Council took over from her the water rights. Later, in 1899, Sir John Murray Scott presented the "Castle Gardens," adjoining the Cathedral grounds, to the town. They contain the ruins of the old Conway Castle, a beautiful lime-tree walk, a monument to Sir Richard Wallace, and a gun captured at Sebastopol. 1884. -- Canon W. D. Pounden, Rector of the Cathedral, 1884-1917. 1885. -- Thompson Memorial Home opened. A home for aged and incurable people of both sexes. Erected to the memory of William Thompson, M.D., surgeon of the County Antrim Infirmary for almost half a century. 1889. -- Rebuilding the Assembly Rooms completed. The old Market House occupied the lower portion of the old Assembly Rooms. 1888. -- Alexander Boyd & Company's premises erected at the corner of Railway Street, opposite the Northern Bank. 1890. -- The Temperance Institute erected. Sir Richard Wallace gave the site free. The building and furnishing cost some £3,500. 1893. -- The water and market rights acquired from Lady Wallace. About 1901 the Courthouse, Assembly Rooms and Town Hall (Estate Office) (were purchased from Sir John Murray Scott. The markets reconstructed and remodelled about the year 1896. 1894. -- Post Office, Railway Street, erected. 1894. -- From 1894 forward the Wallace estate gradually passed into the hands of the tenants, the holdings being bought by occupiers on favourable terms under the Irish Land Commission. Head rents and ground rents in the town of Lisburn were also disposed of by the office to occupiers' or owners at twenty years' purchase. Badges are as common as blackberries now-a-days. The war has been the means of adding greatly to their number. Who is prouder of his badge than the boy-scout. The badge is the outward sign to all whom it may concern that the wearer is -- well, something, that everybody is not. The boy-scout has his triple pledge, as exemplified by his badge. Serve God; honour the King; do a good turn every day. The badge I am thinking of is a triple one, too -- "the dear little shamrock of Ireland." Historians differ as to where St. Patrick was born, but it is generally held to have been in Dumbarton, that he first saw the light. From here at the age of sixteen he was captured in a raid, and carried to the north of Ireland, fired with a resolve to convert his heathen countrymen to the Christian faith. He used, as you know, the three-leaved shamrock, as a little object lesson, to give his hearers an idea of the nature of the true God. Now as to what exactly was the shamrock he made use of, "doctors differ." Some say it was the Dutch clover; others hint that it may have been the common wood-sorrel, but in any case it does not spoil the story. As loyal Irish boys and girls, we claim St. Patrick as a true Irishman. St. Patrick's cross appears in another triple combination -- the Union Jack. It was added to the flags of St. George and St. Andrew in the year 1801. Our flag has gained fresh and undying lustre to its name these, last four years, and its motto, "Quis separabit," has been borne through many a battlefield. 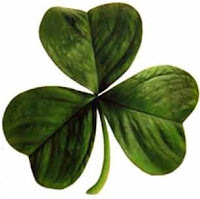 So that when we think of March 17th; St. Patrick; and the shamrock; let our thoughts go back to an Ireland of a ruder time, when the "dear little plant' taught our forefathers -- a good lesson. As love and valour wandered. Shoots up with dew-drops streaming. O the shamrock, the green immortal shamrock! Those leafy gems of morning!" Lore, Valour, Wit for ever!" To the shamrock, the green immortal shamrock! 1791. -- Theobold Wolfe Tone founded the first Society of United Irishmen in Belfast. 1795. -- The Society of United Irishmen reorganized as a secret society. Formerly its stated object was an honourable one, from this forward its real aim was to overthrow the Government and establish a republic. 1796. -- Rev Snowden Cupples officiated as rector of the Cathedral from 1796 to 1835. 1797. -- Four soldiers were executed on Blaris Moor for treasonable practices. 1798. -- Blaris Moor was a vast military encampment. In 1689 and 1690 Blaris was also occupied by Duke Schomberg's troops. 1798. -- In the towns of Belfast, Lisburn, and Carrickfergus the disaffected and United Irishmen were awed into submission by their numerous garrisons, yet several zealous adherents from these towns passed into the country and were actively engaged in the insurgent ranks. 1798. -- The different yeomanry corps on the Hertford Estate amounted to about 1,000 men, two troops of cavalry and nine companies of infantry. Lisburn also in 1780 supplied its quota to the volunteers. 1798. -- Population about 4,000. Cotton spinning, muslin weaving and linen manufacture carried on. The three tanyards in the town were owned respectively by George Whitla, Thomas Beatty, and Clegg and M'Collum. The Lisburn Brewery had much celebrity for its superior ales. 1798. -- Harry Munro was born in Lisburn, May, 1758. When in his fifteenth year, he was taught linen weaving, and later was a buyer of linen webbs. He was a member of the Established Church. In 1796 he became a member of the Society of United Irishmen. He commanded the rebel army at Ballynahinch on June 13th, and after its defeat was captured and executed in the Market Square, Lisburn on June 17, 1798. Munro was hanged and afterwards beheaded. The scaffold was erected in the Market Square, almost opposite Munro's house, close to the south west corner of the premises now occupied by Messrs. Duncan and Sons. The corner house was then in possession of James Ward, a printer and bookseller, and on the ledge of an upper window of this house part of the scaffolding rested. Three other men were executed in Lisburn about me same time. 1801. -- Alexander Turney Stewart, millionaire and philanthropist, was born at Red Hill, Lissue, Lisburn, in 1801. He emigrated to New York in 1818, where a few years later he opened his first dry-goods store. His charities were numerous yet at his death in 1876 he left some £8,000,000. His body was stolen in 1878, and restored to his widow three years after, on the payment of £4,000 through a lawyer. 1803. -- Heterogenea, or Medley. By John Moore Johnston. This volume, aptly named by its author, "A Medley," embraced within its varied contents a history of Lisburn and district. It was printed in Downpatrick in the year 1803. 1804. -- Robert Owenson's theatrical company gave performances 1803-1804, at a theatre improvised out of a large hayloft in Bow Street, situate in the rere of Mr. Stewart's house, opposite the new road to Hillsborough, Owenson's daughters afterwards became Lady Morgan, and Lady Clarke, and a young actress of the company -- Miss O'Neill -- became Lady Beecher. Lady Morgan was author of the "Wild Irish Girl," and numerous other works of fiction. 1804. -- Wm. Brownlow and Co. opened their bank in Lisburn, but apparently closed it almost immediately afterwards and recommenced business in Lurgan. 1805. -- Hugh M'Call, born in Chapel Hill, Lisburn, 1805, died in the town of his nativity, 1897. Wrote several works of great local interest and was a voluminous contributor to the daily press. 1807. -- The Cathedral, when re-built after the fire of 1707, was minus the spire. This was added by the second Marquis of Hertford, in 1807. Since then, from its lofty height, the curfew bell has sounded forth nightly at 9 o'clock, 100 strokes, marking the ancient custom and the hour. 1814. -- Lough Neagh completely frozen over and so thick was the ice, that Colonel Heyland went across on horseback from Crumlin, water-foot to Rams Island. 1814. -- James M'Kowen, the Lambeg poet, a clever and popular writer of verse. Born at Lambeg, 1814, died in Lisburn, 1889. He wrote over the signature of "Kitty Connor," and was the author of "The Ould Irish Jig." 1819. 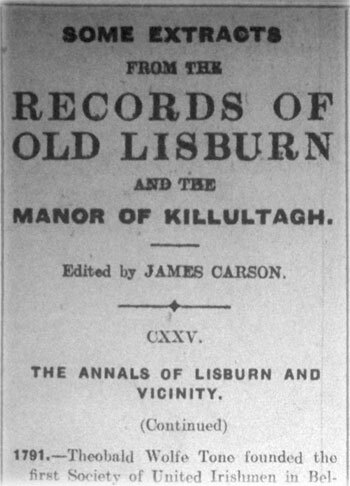 -- A directory and history of Lisburn was published by Thomas Bradshaw. 1821. -- Population of Lisburn, 4,684. 1823. -- Hilden Thread Mills, established. The work was previously carried on at Plantation from the year 1784. 1824. -- The Northern Banking Co. established with a capital of £500,000. 1824. -- Pigot and Co. published their City of Dublin and Hibernian Directory. 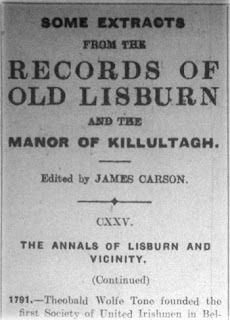 It contains a short historical sketch of Lisburn and a directory of the inhabitants. 1826. -- The Belfast Banking Co. established with a capital of £500,000. Now amalgamated with the London City and Midland Bank. 1827. -- Ballinderry church erected at a cost of £2,000. The Marquis of Hertford contributing half the amount. 1832. -- Organ presented to the Cathedral by the Marquis of Hertford. 1834. -- Henry Bayly published a topographical and historical account of Lisburn with a poem on the same. 1835. -- The Northern Bank opened in Lisburn. The name of the first manager is not now available. H. J. Manley appointed in 1842, R. H. Bland. 1875, John Preston, 1878, William Young, 1910. 1835. -- Robert Stewart and Sons, yarn and thread manufacturers, established. Absorbed by the Linen Thread Co., Ltd., in 1899. George Duncan and Sons, Drapers, Market Square, established in 1835. 1835. -- Prior to this year the chief main roads about Lisburn were in existence, viz., the Belfast, Belsize, Antrim, Moira, Ballinderry and Dublin Roads. 1835. -- Dean Stannus, rector of the Cathedral, 1835-1876. 1836. -- The Ulster Banking Co. established with a capital of £1,000,000. Now amalgamated with the London County and Westminster Bank. 1836. -- Sir Robert Hart, of Chinese fame, born in Portadown. His father afterwards resided for a time at Hillsborough, and later at Ravarnette. 1836. -- First News-room opened in Lisburn, Wm. Graham, chairman; John Millar, treasurer; Hugh M'Call, secretary. 84 members. 1839. -- The year of the "Big Wind." Over all Great Britain and Ireland the destruction done was dreadful, and not least in Ulster. In December, 1894, a violent storm raged over the North of Ireland, Hilden and Ravarnette Mill Chimneys were blown down and a house unroofed in Market Square. 1839. -- The section of the Ulster Railway between Belfast and Lisburn opened. The first train started from Belfast at 7 o'clock in the morning. Large crowds assembled to witness the start. At various parts along the line multitudes were collected, and at Lisburn the train was greeted with enthusiastic cheers by a numerous concourse of people. 1839. -- Railway Street was originally known as Jackson's Lane, and it was only after the Railway reached Lisburn in 1839, that it gradually came to be known by its present name. 1841. -- Lisburn Union Workhouse opened for the reception of paupers. Closed as a workhouse in 1918, and the inmates transferred to Lurgan Union. 1842. -- Christ Church, or as it was frequent called, the New Church, was erected in 1842, and later considerably enlarged and improved. Adjoining the Church grounds are the Nicholson Memorial Schools, built in 1864, by Mrs. Nicholson in memory of her children, one of whom was the illustrious General John Nicholson of Indian fame.